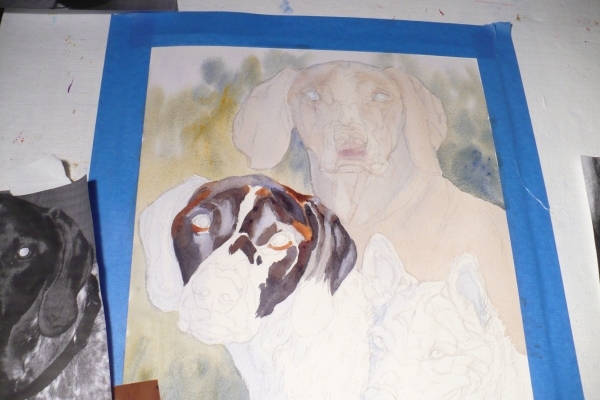 Now that the composition is drawn in and a light background wash of color applied, it's time to paint the dogs. I've put a wash of light color on the Weimaraner in the background. Her name is Vaeda. We'll go back to her later. Right now, I want to start with the German Shorthair Pointer - Gunner. 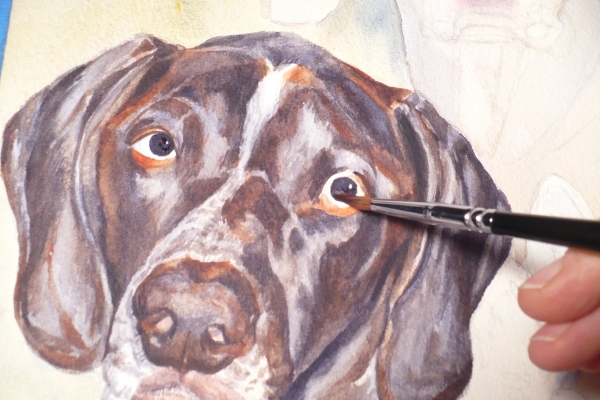 Following the areas I've drawn on his face, I fill in washes of color, some brown, some blue where the highlights are. The eyes are important. They should look alive. Adding a highlight to each pupil helps with this. Since I'm painting with watercolor, this means the white of the paper must be left for those highlights. 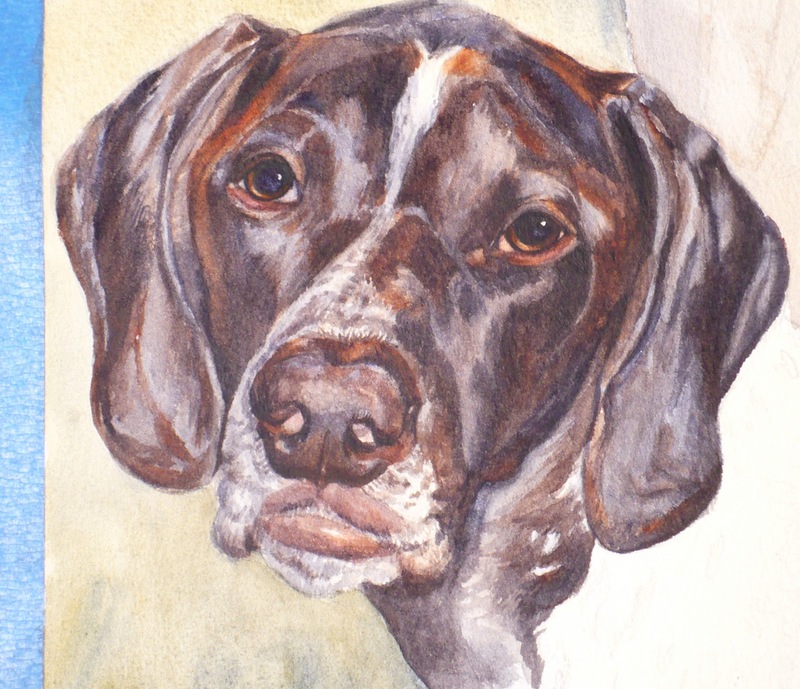 Here's Gunner's face. He may need more work and his chest still needs to be painted. But I'd like to get all the faces of the dogs done first. Next up is Sam, a Shepherd mix. 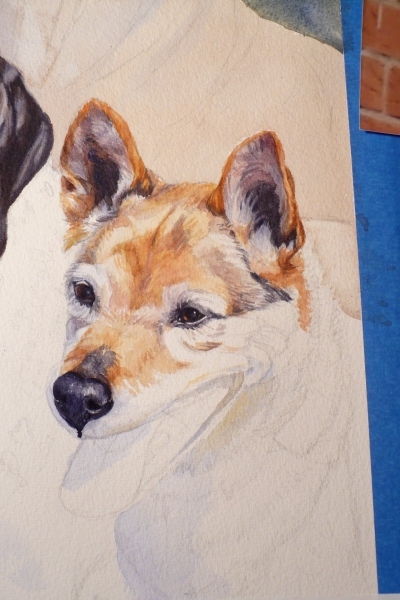 I enjoy painting this little dog because his face reminds me of a fox and also because he looks so happy! 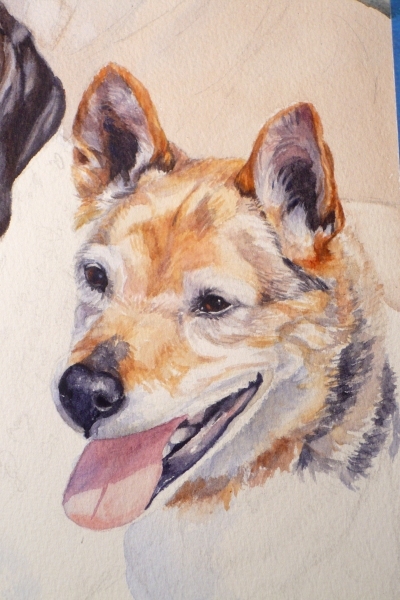 Here is Sam's face completed - doesn't he look like a happy pup? Painting the two dogs has taken hours of work and it is now late at night. As I've also been spending time preparing the house for company on Christmas Day, I am tired! So in the morning, I'll paint Vaeda's face and then finish the rest of the painting so it is complete by the time the client comes to pick it up! Click here to see the final touches of this three dog portrait.